It is kumis season; mare's have given birth to colts and fillies, and the hills are green with new grasses. 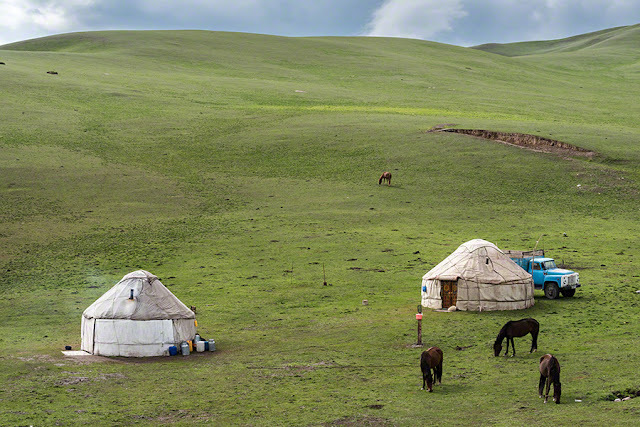 Kumis is fermented mare's milk which to a non-Central Asian native, sounds disgusting. After tasting kumis made by Aynagul, I'll settle on it being an acquired taste. Kumis is mildly alcoholic and is consumed by Kyrgyz young and old. It is the fermentation that makes it a healthy drink providing nutrition as well as digestive balance. 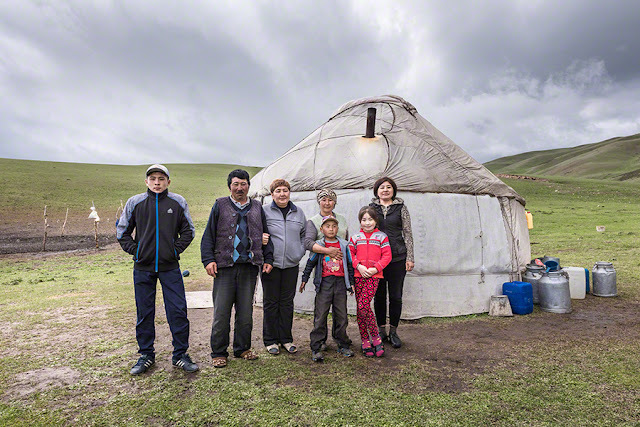 With the help of our guide/driver Vladimir, we approached a Kyrgyz family that raises horses and makes kumis. We were immediately welcomed into their yurt. Aynagul showed us her kumis and poured us a cup. Then she began setting the low table with freshly cut bread, her homemade preserves, kaymak, and made tea for all. And, because she could tell that I wasn't enamored with the taste of kumis, she poured me an unfermented cup of mare's milk--which I liked. The mare's milk was also good in tea. While enjoying Aynagul's hospitality, she explained that she gets about 1 liter of milk from each mare each day. 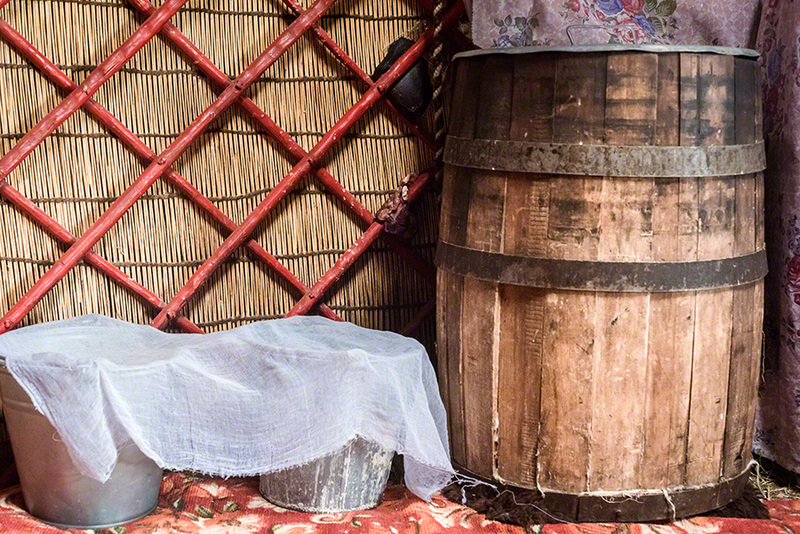 Once the milk has cooled, she pours it into a wooden barrel and churns/stirs it. And, that's it. The milk will be sufficiently fermented in 24 hours. The barrel is prepared in advance and sterilized by setting it upside down on a fire of archa wood. Archa is a juniper native to Kyrgyzstan that has antiseptic qualities. Her method of making kumis is traditional except that she uses the barrel instead of a goatskin for the fermentation process. Aynagul and her relatives asked us some questions, too. They wanted to know how old I was. When I told them my age, they nodded knowingly. Then, they asked Dan his age. When he told them, the responded, "super." So, I guess I look like a 60-year old woman, but Dan looks like someone much younger. I asked Aynagul how old she was and she refused to tell me. A wise response--I wish I'd thought of that. After learning the process of making kumis, Aynagul asked us if we'd like to watch her milk the mares. 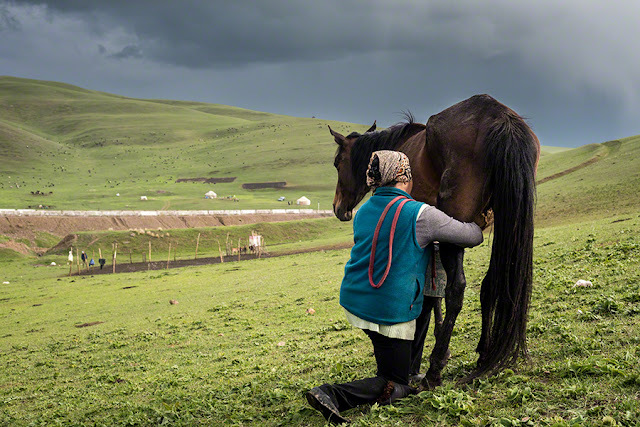 Her family has 17 horses and 800 head of sheep. Some of the mare's were relaxed about the milking process, but for the more skittish mares, Aynagul tied their rear legs together with a soft rope, and we kept our distance. When she began milking, it began to snow slightly, and then it stopped leaving the most amazing dark skies above. They also have a couple of turkeys who have turkey chicks. When Aynagul headed back to the yurt with her pails, the turkeys came running. Before we left, we were invited to peek inside the other yurt. This yurt now belongs to Kenge, Aynagul's niece. Kenge inherited it from her mother. The yurt is 27 years old and spectacular inside. The family lives in this surrounding beauty for 5 months every year during the kumis season. 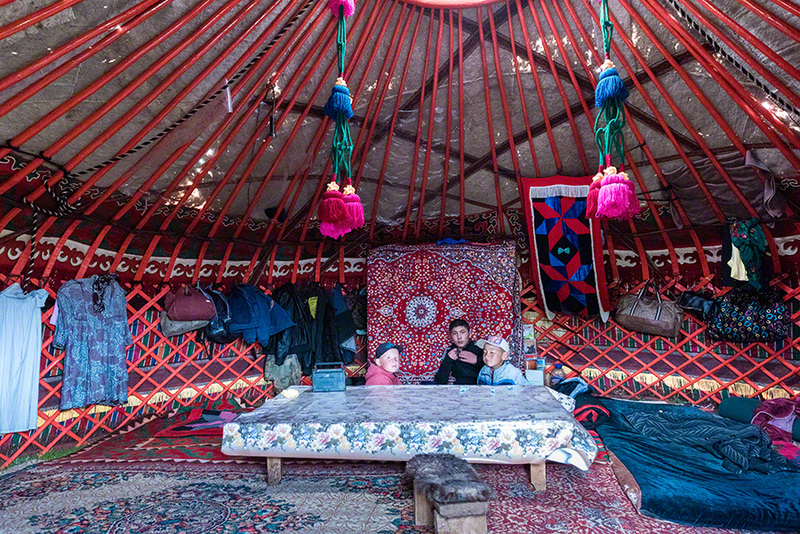 In the winter months they live in the village of At-Bashy. 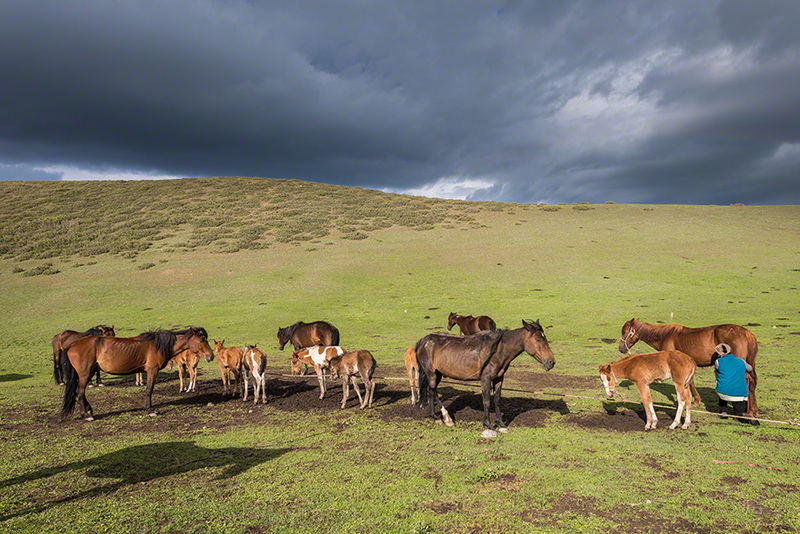 And, then we were on our way again to Naryn and our guesthouse for the night.